G20 to China’s Hu Jintao: Bring Cash! Australia’s got a new reality show to fascinate over. Called “Border Security” this profiles real-life customs and immigration officers on the beat. Whoever thought standing by an airport luggage carousel would make gripping national television? Well before reality came to Australian Customs, there were cases where they would arrest travelers coming in from China. They weren’t smuggling drugs or rare jewels. Instead they were carrying suitcases of cash. Apparently they weren’t aware you needed to declare amounts over $10,000. These investors were coming to Australia to buy houses. 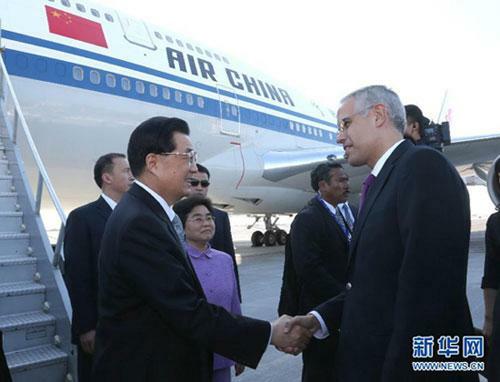 Yesterday China’s President Hu Jintao flew into Mexico. He is at Los Cabos to attend the G20 World Leader Summit today and tomorrow. Can I help you with your suitcases? All newspapers report a G20 summit that will be dominated by talk of Greece, Spain and the future of the Euro. That doesn’t please China. Given the new world order, more attention at these meetings need to be devoted to developing nations – like China. “We should continue to give high priority to development and promote growth of developing countries so as to increase total global demand,” said Hu in a written interview with Mexico’s Reforma newspaper. But that doesn’t sit easy with the USA. According to Ding Chun, an expert in European affairs at Fudan University, China will face resistance to gaining greater power in exchange for propping up Europe’s economies. Perhaps Hu Jintao is better off checking his suitcases with the Bell Captain then heading off to enjoy the beaches of Cabos. I’m sure jet-boat rental companies take Renminbi.